Red Cloud Indian School honored the hard work and dedication of volunteer staff during the week of March 9-17. The week, which coincides with the national celebration of AmeriCorps Week, highlights and recognize the 32 volunteers from across the country who support everyday operations at the school. Volunteers were surprised with balloons and candies and given commemorative mugs in addition to school-wide proclamations of thanks and support. 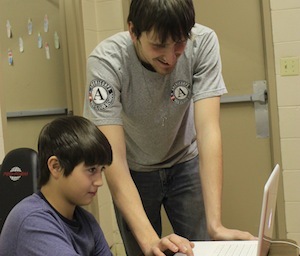 Participants in the Red Cloud’s Volunteer and AmeriCorps programs hold a range of important positions at the school, serving as librarians, bus drivers, teachers, and program directors. 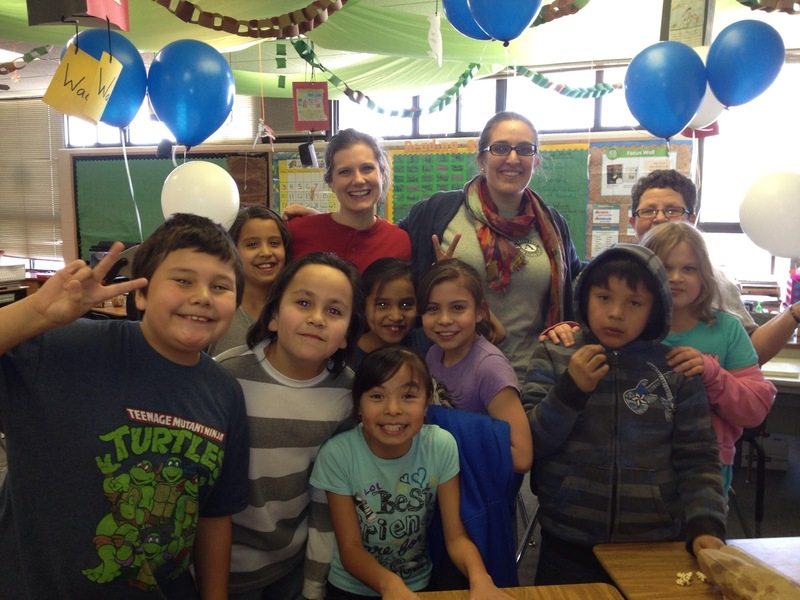 Through the support of former volunteer, Erin Anderson, now Red Cloud Volunteer Program coordinator and Margi Bettelyoun, AmeriCorps director, the school is able to supplement its staff and meet critical needs on campus. “Our Red Cloud Volunteers and AmeriCorps members have a tremendous impact in the school, allowing us to provide a more diverse and quality education to our students,” says Ted Hamilton, Red Cloud’s superintendent. 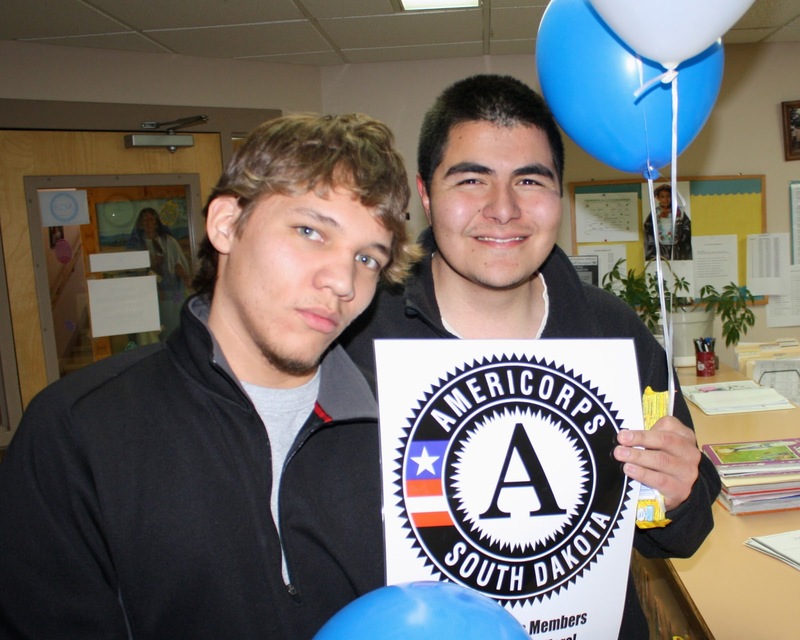 “During an average school year, AmeriCorps members alone dedicate approximately 40,000 hours to the students of Red Cloud Indian School. The impact of this service is realized through the continued achievements of the students,” says Bettelyoun. Volunteers at Red Cloud acknowledge that, while the experience can be challenging, it also brings significant rewards. “I’ve never felt stronger,” shares Clare Heurter, a freshman English teacher and Red Cloud Volunteer who is also working toward her graduate degree at Creighton University. “There are so many difficult things to overcome as a volunteer – long nights, stacks of papers to correct, homework for my graduate classes – but you know what? You do it.” Heurter says knowing she can overcome life’s obstacles has informed who she will become as a professional. Red Cloud’s volunteer programs focus on providing meaningful opportunities for professional development. The Red Cloud Volunteer Program runs directly through the school, providing mid- and entry-level professionals with opportunities to gain experience through service. Red Cloud’s AmeriCorps Members come from across the nation and from within the local community, providing employment opportunities for recent graduates, while also providing financial support for student loans and continuing education. “Being part of the program provided me with the opportunity to interact with young professionals who I have learned a lot from,” says Elizabeth Welch, a third year Red Cloud volunteer who is also an AmeriCorps member. Based on her experiences at Red Cloud, Welch has decided to pursue a graduate degree in social work that she will use to increase her impact on the reservation in the future. For many volunteers, their term of service begins to blend with and inspire their future career choices. Erin Anderson returned to Red Cloud last year to join other former volunteers and colleagues as a paid employee. “It felt like I had arrived,” says TJ Lynch, a former Red Cloud Volunteer. “After being asked to stay on after my service was an honor because I knew I would be able to continue my professional development while being able to continue my support of the school and students.” Lynch now holds positions as the Business Manager, Network and Student Information Systems Administrator and 21st Century Grant Director at Our Lady of Lourdes Elementary. Service in education continues to be a central tenet of the school’s philosophy, where staff lead by example to the next generation of learners. To learn more about the volunteer opportunities at Red Cloud Indian School visit www.redcloudschool.org/volunteer.